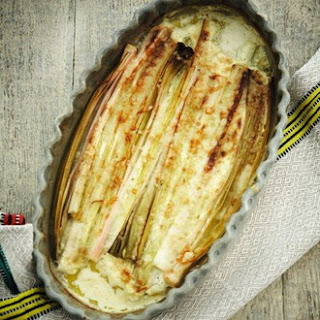 Heat the oven to 160°C (gas mark 2-3) and grease a baking dish large enough to hold the leeks in two layers. Trim the roots from the leeks and most of the green, then quarter them lengthways. Rinse the leeks to remove the dirt and pat dry with kitchen roll or a clean tea towel. Place the leeks in the prepared dish and season with salt and pepper. Add some thyme or finely chopped rosemary if you wish. Dot with the butter, then pour on the stock and bake for about 45 minutes. If the leeks start to colour, cover them with foil. Remove the foil and sprinkle with the cheese. Return to the oven until the cheese has melted and is golden. Savour.